"We Few.. We Happy Few.. We Band Of Brothers"
Barr's Battery had its origins in the Summer of 1861 when the Kanawha Artillery was formed under the command of Capt. John P. Hale. The battery was later commanded by Capt. Thomas E. Jackson. The battery served in Gen. John B. Floyd's command at Fort Donelson, Tennessee. When the fort fell to Union forces in Feb.1862 the battery's members were paroled and sent home. In the fall of 1862,Gen.Floyd was given permission to raise a division of troops for service within the boundaries of Virginia. This unit was to be the Virginia State Line. The mission of the VSL was ostensibly to control depredations of Union forces and Unionist guerillas in the mountainous regions of western Virginia and regain Confederate control of the region. Thomas E. Jackson, now a major, was given the assignment of raising an artillery battalion for the VSL. He raised three companies. Co.A, commanded by Capt.Warfield P. Semmes. Second in command was Lt. John T. Levi. 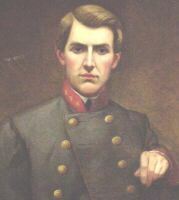 Co. B, commanded by Capt.John Mayo Oliver. August's Howitzer Battery, commanded by Capt. James August. Second in command was Lt. John W. Barr. Jackson's Artillery Battalion was officially organized in December, 1862. It was destined to see no action as a unit. This was however the official beginning of Levi's-Barr's Light Artillery. Confederate authorities, having decided the troops of the VSL could better be put to use by having them in regular units, disbanded the State Line in March,1863 and its troops were transferred to regular Confederate service. The Virginia State Line Artillery was reorganized and redesignated. The Kanawha Artillery, having been declared exchanged, was reorganized as the Charlottesville Horse Artillery on May 1,1863 with Capt. Thomas E. Jackson in command. Oliver's Battery was redesignated as Co. K, 21st Virginia Cavalry. Capt. Oliver was killed in action at Wytheville, Virginia in July,1863. The officers of the battery were Capt. John T. Levi and 1st Lt. John W. Barr. Both were former officers of the Virginia State Line. Lt. Barr had previously served in the 1st Co. of the Richmond Howitzers Battalion. Upon its organization the battery was assigned to Walker's Battalion of The Thomas Legion, an organization of mountaineers and Cherokee Indians. A key assignment for Levi's Battery and The Thomas Legion was the security of the Virginia-Tennessee Railroad which ran from Chattanooga,Tennessee to Richmond, Virginia. The railroad, which was a vital lifeline of the Confederacy, ran through the heart of one of the staunchest Union enclaves in the South, East Tennessee. Since this line was a major communications link and transportation corridor for troops and materiel throughout the South it was a key target for Union forces and Unionist guerillas and saboteurs. Destruction of this vital railway would be disastrous for the Confederacy. Large numbers of Rebel troops were required to protect the railroad. Levi's Battery and The Thomas Legion were a vital part of this Rebel force. The battery saw its first action at Strawberry Plains, Tennessee in June,1863. In this action the battery lost all four of its guns due to inadequate Infantry support. The next action for the battery occurred at Wytheville Crossroads, Virginia in July,1863. No record exists of whether they had replacements for their lost guns but it is safe to assume they had no cannon and probably fought as Infantry or dismounted Cavalry at Wytheville. From August until December, 1863 the battery was attached to BGen. John S. "Cerro Gordo" Williams' Cavalry Brigade. The battery is listed as having four guns. With Williams' Brigade the battery saw action in Lt. Gen. James Longstreet's East Tennessee Campaign. On Oct.31,1863 Levi's Battery was officially detached from Thomas' Legion and reassigned as Artillery in Gen. John C. Breckinridge's Division of the Dept. of Western Virginia. Saltville, Virginia was a primary focal point of Confederate defenses during the war. The salt works there was the primary source of the Confederacy's supply of the vital and necessary element, providing 83 percent of the salt used by the South. In the days before refrigeration salt was necessary to preserve meats which were critical to the survival of the armies and citizens of the Confederacy. Virginia's sister states in the Confederacy leased facilities at the works to process the vital mineral. Wagon trains came from all over the South to pick up the necessary salt. Knowing of the necessity of the salt to the South's survival, the Federal command made destruction of the salt works a key part of their strategy for vanquishing the Confederacy. Without salt foods could not be preserved. Without food the Confederate soldiers and citizens would starve. Starving people are easily conquered. In January,1864 Levi's Battery joined the 45th Virginia Infantry, Burroughs Tennessee Battery, and McClung's Tennessee Battery at Saltville to aid in defense of the salt works. On Jan,25,1864 BGen.Alfred E. Jackson brought charges against Capt. Levi. The reasons are not recorded but Levi was cashiered from the service. Lt. John W. Barr was placed in command of the battery and was officially promoted to Captain on March 22,1864. On Feb.29,1864 the battery was moved to Carter's Depot, Tennessee to counter a Federal threat. During the month of April the battery was attached to BGen A.E. Jackson's Cavalry Brigade for operations in East Tennessee. On May 1, the battery was back at Carter's Depot. On May 5 the battery was back at Saltville with the Thomas Legion. The Legion was ordered to join Gen. Early in the Shenandoah Valley but Barr's Battery remained behind to defend Saltville. At this time the Dept. of Western Virginia got a new commander, Gen. John Hunt Morgan. As Morgan marshaled his forces for another raid into Kentucky, his artillery was left behind to safeguard the Saltworks and the railroad. The battery spent the summer of 1864 on picket duty back and forth between Abingdon and Saltville. Morgan was forced out of Kentucky by overwhelming Union forces and was killed at Greeneville, Tennessee in Sept.,1864. BGen John Echols temporarily assumed command of the department. General Breckinridge returned in late September and held command until January, 1865 when Echols once again assumed command. This time Echols would be in command until the close of hostilities in April, 1865. All previous attempts by the Federals to destroy the salt works had been thwarted. In the Autumn of 1864 the Federals gathered forces for a major assault on the works. BGen. Stephen Burbridge was in command. Confederate troops were rushed to Saltville to counter the move. On Sunday, October 2, 1864, Burbridge launched his attack. Although outnumbered, two to one, the Confederate forces persevered and won the day, repulsing the Federals, preserving the town and its vital salt works for the beleaguered Confederacy. After the fight Burbridge silently retreated back to Kentucky under cover of darkness leaving his dead and wounded on the field. By the time the Rebels discovered his movement Burbridge was too far ahead of them for their efforts to give chase to be effective. The Rebel victory was a substantial one. Barr's Battery and McClung's Battery played a significant role in the defeat of the Yankees. The fire of the two batteries, strategically positioned on the heights overlooking the field of battle, was extremely lethal to the Union troops. Until the Autumn of 1864 the Artillery in Western Virginia had been used piecemeal by whatever commander needed them. The various batteries had been attached one or two at a time to individual brigades for whatever operations in which they were involved. General Breckinridge realized that his Artillery needed to be concentrated in a central command. He asked General Robert E. Lee for an artillerist who could reorganize the Artillery in his division. In October Major Richard C.M. Page was sent,, from Headquarters, Army of Northern Virginia to take command of Artillery in western Virginia. His mission was to organize the Artillery into a cohesive unit and to increase their efficiency. Apparently Page succeeded in his aim to improve the artillery in Breckinridge's division for one of Robert E. Lee's artillery inspectors was quoted to have remarked that the battalion was "The finest battalion of light artillery ever seen in that part of the world". Most of the troops in the battalion had combat experience but the majority of their equipment was in a poor state. Page took charge immediately and proceeded to do all that was possible to bring his battalion up to standard. On October 22, 1864 Douthat's Battery was ordered back to Staunton, Virginia to rejoin Early's Command. It returned to Page's Battalion in Mid-December. During the month of November, 1864 the battery took part in Breckinridge's East Tennessee operations. They served in these actions as dismounted Cavalry as they had no horses with which to transport their guns. During this time Breckinridge had left the salt works completely undefended. By November 16, 1864 Breckinridge had reassembled all his artillery at Wytheville, Virginia. In Dec.1864 the Federals once again made an assault on southwest Virginia. This time Gen. George Stoneman led the force. Breckinridge's forces, by this stage of the war, had dwindled as most of the regular troops had been withdrawn to other regions. Though they were few in number, all the regular troops in Breckinridge's division were combat experienced and still quite a formidable fighting force. As the Federal forces entered the area they were met with delaying actions by Confederate forces, of which Barr's Battery was a part, at Kingsport, Tennessee and Bristol. On the 15th of December Barr's Battery was at Saltville preparing to oppose Stoneman's forces. Breckinridge's forces were scattered throughout the region. He met the Federals at Marion, Virginia on December 18, 1864 but had to retreat as he was greatly outnumbered. Stoneman then pushed on to Saltville. The only viable Confederate force to oppose him was Barr's Battery, Kain's Tennessee Artillerists( These two units were the only regulars at Saltville), King's Battery (Newly returned from the Richmond/Petersburg line, where they had served for several months) and various Home Guards and Reserves. Heavily outnumbered the Rebel forces were pushed aside and Stoneman managed to damage the salt works but not seriously. The works were back in operation within a month. Barr's men did not take any cannons with them when they left Page's Battalion. Many artillery units ordered to Petersburg left their guns behind when they rejoined the Army of Northern Virginia. Upon its arrival in Richmond the battery was assigned as one of five independent batteries in the Chaffin's Bluff Defense Line. These five batteries were essentially a battalion under the command of Major Robert Stiles as part of Crutchfield's Brigade. The 18th Georgia Battalion was a member of Crutchfield's Brigade as well. Also serving in the Chaffin's Bluff Line was the 9th Georgia Battalion of Light Artillery. The 9th Georgia had served alongside Levi's-Barr's Artillery in the East Tennessee Campaign. On the evening of April 2,1865 all troops were ordered to evacuate their defenses. The Army of Northern Virginia had begun its final retreat. As there was no transport for their cannon, Crutchfield's Brigade destroyed their guns and marched out of the trenches as Infantry, to destiny at a placed called Appomattox. Union Cavalry constantly harrassed Lee's retreating columns. Custis Lee's Division, skirmished with Union Cavalry all along the line of retreat, acting as a rear guard for the Army of Northern Virginia. Major Stiles' Battalion acted as skirmishers on the flanks of the retreating Confederate column, encountering Union skirmishers on the evening of April 5. On April 6, 1865 the retreating Rebel column fended off Federal forces at several points along the line of retreat at Deatonsville, Lockett Farm, Harper's Farm, Hillsman's Farm. Finally, after having repelled their enemies at these points during the day, the Rebels turned on their enemies and formed a main battle line at Sayler's Creek. Barr's Battery, and the rest of Stiles' Battalion, was the right flank of Crutchfield's Brigade which was to the right of center in the Confederate battle line. On Stiles' right was the 18th Georgia Battalion commanded by Major William S. Basinger. The 18th Georgia was the right flank of Crutchfield's Brigade. The 18th had also been in the Chaffin's Bluff Line. Maj. Gen. Joseph B. Kershaw's Division was the extreme right of the Confederate line. In an after action report Major Basinger said of Stiles' Battalion..."There was something surprising in their perfect steadiness and order...". ***** This should not have surprised the Georgia offficer as most of the members of Stiles' Battalion had seen action at various places before being assigned to the Chaffin's Bluff Line. Pursuing Federal forces opened fire on the Rebels with artillery, using solid shot and shells. The Confederates had no artillery of their own with which to respond. There was no protection from the Federal fire except broom sage and scrub pine. The Rebels withstood the galling fire with steadiness and courage. After a while the Federal fire slackened and the blue infantry formed their lines to advance, but they hesitated. Upon seeing their enemies hesitate, Stiles' Battalion charged the Yankees. It was this action which started the general advance on the Union lines. In his report on the action Major Basinger, being closest to Stiles' men said "...such was the eagerness of Major Stiles' men, that upon perceiving the enemy's hesitation, sprang up and rushed upon them, fixing bayonets as they advanced". *****( To read Major Basinger's report in full, go to the dedication page of this site). Judging from Major Basinger's observation of the bayonet charge at Sayler's Creek, it would appear that the nom de guerre "The Louisiana Tigers" for Barr's Battery was NOT a misnomer. Very seldom during the Civil War did artillerymen get to participate in a bayonet charge! At first, stunned by the fury and audacity of the Rebels, the Federals gave way and were pushed back across Sayler's Creek. After reforming the Yankees counter attacked and by sheer weight of numbers overwhelmed the Confederate line. The fighting became vicious, erupting into hand to hand combat along the line. 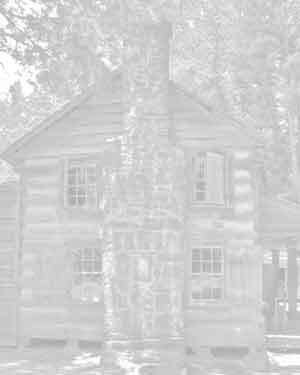 The Rebels, starved and ragged( the only rations issued for three days had been one pound of corn meal and one-third pound of bacon), disintegrated under the onslaught. Having no other recourse, outgunned and outmanned, they threw down their weapons and began to surrender. It must be noted that Stiles' Battalion and the 18th Georgia Battalion DID NOT surrender until word reached them that General Ewell had surrendered the Corps and all troops were to follow suit! Thousands were killed,wounded, or captured. Among the prisoners was the Division Commander, Gen. G.W.C.Lee (the son of Gen. Robert E. Lee). Col. Crutchfield was mortally wounded in the fight. The Battle of Sayler's Creek, the last major engagement of the Army of Northern Virginia, was the death knell for Barr's Battery and Stiles' Chaffin's Bluff Battalion. The casualties in Stiles' Battalion were 100 killed and wounded. The exact numbers of troops in the battalion are not known, but it is safe to assume that the combined strength, in the 5 batteries in Stiles' Battalion, was no more than three to four hundred men. If that many. Part of the battalion escaped the destruction at Sayler's Creek to join the rest of the Army at Appomattox Courthouse. The numbers were few. The 18th Georgia Battalion had 82% of its men killed and wounded. This is 70 out of the 85 engaged. Capt. Barr,Lt. W.F. Campbell, and twenty-five enlisted men were captured. This was apparently all that was left of the battery after two years of service. Two men, David D. Smith and S.R. Davenport did not appear on Federal Prisoner of War rosters for Sayler's Creek. It is not recorded whether they made good their escape, from the Federal forces that overwhelmed them, to join the rest of the Army at Appomattox. It is possible they did and joined with the remnants of Crutchfield's Brigade which surrendered on April 9. It is also possible that they "paroled themselves" and walked straight home. This was a common occurrence in the waning days of the war as the Army disintegrated. Those troops who survived the fighting at Sayler's Creek, and managed to evade the Union juggernaut which had overwhelmed them, made their way onward to join the rest of the Army in its retreat to Appomattox Courthouse. General Robert E. Lee was appalled as he watched the troops, who had escaped the disaster at Sayler's Creek, come straggling in to rejoin the rest of his now hard pressed Army. Upon seeing how few they were and how beaten they looked he is recorded to have exclaimed, "My God! Has the Army dissolved?!" Over one fourth of the Army of Northern Virginia was lost at Sayler's Creek! Three days later on April 9, 1865, General Robert E. Lee surrendered the remnants of his gallant Army to Gen. Ulysses S.Grant at Appomattox Court House. The formal surrender of the Army took place on Wednesday, April 12, 1865. Ironically this was exactly four years to the day since Confederate guns fired on Fort Sumter! In a misting rain, the Rebel soldiers furled their colors and stacked their arms one last time. They then dispersed and walked down many different roads to whatever homes they had left. The once mighty Army of Northern Virginia, passing into history and legend, was no more! Over the next few months the members of Barr's Battery were paroled and released from their various places of captivity. Though they could not be called a "glory" outfit, Barr's Battery performed yeoman service in a vital theater of war, where they were undermanned, underfed, and poorly equipped. Although not officially designated as such, Levi's-Barr's Battery was essentially a Horse Artillery battery, having spent the majority of its service attached to Cavalry brigades. On several occasions, due to the lack of serviceable guns, the battery fought as dismounted cavalry or infantry. Despite all these hardships and setbacks , the battery had the honor of being a member of the greatest army of all time, The Army of Northern Virginia! Their finest hours were at Saltville, The Siege of Petersburg/Richmond, and most especially, the bayonet charge at Sayler's Creek!. They had the distinction of being the only regular Confederate artillery unit recruited from the mountains of Southwest Virginia. They also had the distinction of serving in two theaters of war at the same time. Witness, the section with Thomas's Legion. This distinction is matched by few units, Confederate or Federal. The section which accompanied The Thomas Legion to North Carolina fought in several engagements in North Carolina.